Laptop Design USA Provides Unique Trade Show Incentives for Art-Exchange.com, Inc.
DEARBORN, MI--(Marketwire - June 11, 2007) - Visitors to the NeoCon® Exhibit that opens today at Chicago's Merchandise Mart will find a unique display of artists' work exhibited by Art-Exchange.com, Inc., www.art-exchange.com. 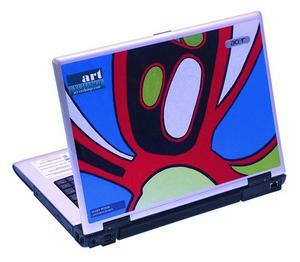 Instead of traditional canvases, artists' work is being displayed on the lids of laptop computers branded by Laptop Design USA, LLC, www.laptopdesignusa.com. "We've branded lots of laptops with customers' unique designs, but Art-Exchange is the first company we've worked with that has recognized the benefits of using our process to promote their own clients who are artists," said Peder Blohm, president of Laptop Design USA. Art-Exchange is a business-to-business exchange that connects artists via the Internet with interior designers and other purchasers of artwork. They maintain a large online gallery of artwork that can be searched by artist name, subject matter, style, medium, sizes, colors and keywords. Interior designers who visit the Art-Exchange exhibit will have an opportunity to participate in drawings to win several unique laptops which include a sample of the artists' work on the laptop lid, a screensaver and a CD of the artist's work. "We're looking forward to the designers' response to this unique way of promoting our artists," said Matt Valentine, COO of Art-Exchange.com, Inc. Laptop Design has developed a high quality process to apply virtually any design and a durable, automotive-quality finish to exterior computer surfaces. The company's paint specialists can match virtually any color to produce matte, high gloss and metallic finishes. Laptop Design USA, LLC is the market leader in the United States to provide branding and customization of computers and other electronic devices for personalization and name recognition. Laptop Design works in partnership with computer manufacturers, major integrators and distributors to brand laptops, towers, and other computer components for customers. The company also directly services a variety of companies, universities, government agencies and others that want increased visibility and security. For more information, visit www.laptopdesignusa.com. Art-Exchange is a business-service-platform company designed to bring services to sellers and buyers of fine art. The company's database contains approximately 100,000 art listings representing more than 10,000 different artists. The company has a database of more than 250,000 artists. This database serves professional buyers in much the same way the Multiple Listing Service serves real estate brokers. Users on the buy-side of the fine art market are designers, art gallery owners, art dealers and professional picture framers who can access needed art more efficiently on Art-Exchange than they could using other traditional methods. For more information, visit www.art-exchange.com.